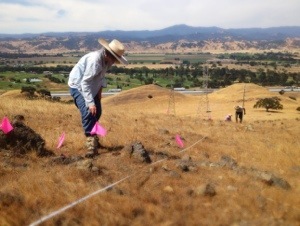 Christal and the Creekside staff on Coyote Ridge monitoring the federally endangered Santa Clara Valley Liveforever (Dudleya abramsii ssp. setchelli). Creekside is using a macroplot methodology and conducting a complete census in 4 permanent plots.